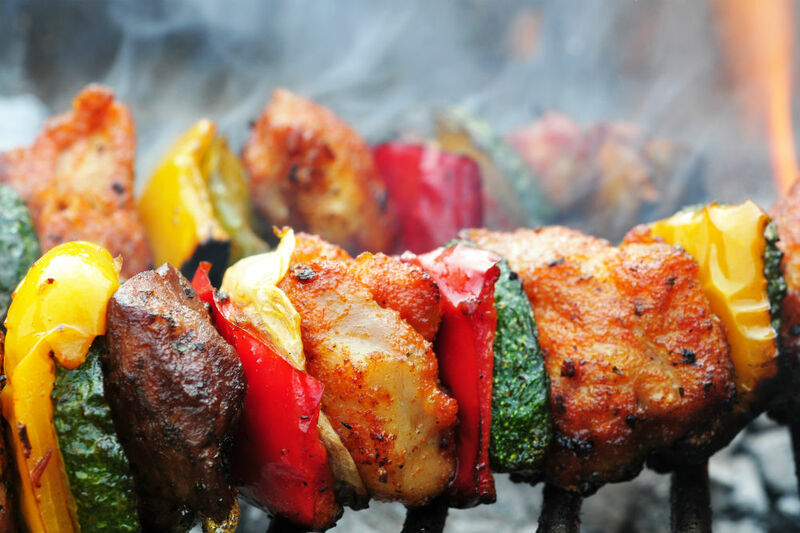 Grilling your food can be a fun job, and when it is using charcoal grill, the process becomes more interesting. With summer just round the corner, you might have plans of camping outside or just enjoying with your friends and family in the backyard. You might even have a charcoal grill in your hands. However, the question is how do you light a charcoal grill? 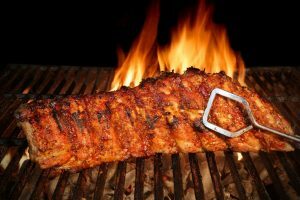 When it comes to charcoal grill, you would have a residue of charcoal and ash from the last time. So, before you start anything, you would need to clean them. The process is simple. All you need to do is remove the grate from top of the grill, clean it and then replace the grate. Once you have removed the residual ash and charcoal, you need to set up the grill so that you can prepare food in it. Start by opening the vents on the bottom of the grill. Then you would need to arrange the pieces of charcoal in a pyramid form in the container, on the grate. Pour in some lighter fluid to help in the process of ignition. Now you are ready to start using the same. Once you have added the fluid, take out a long lighter or a match to light the pieces of charcoal in the grill. It might take some time and effort to get started. If your charcoals are covered in ash and are emitting reddish glow, that means they are ready to be used. After you start the lighting, you would need to wait approximately 15 minutes to get the fire started. Once you have started the fire, you would need to arrange pieces of charcoal to make sure that the food is ready to be cooked. You need to use a spatula or a pair of tongs to spread out the charcoal. The arrangement would depend on the type of food you are cooking. For example, if you are preparing a thinner meal, more heat will burn the food. So, you would need to spread out the charcoal pieces towards the bottom of the grill. 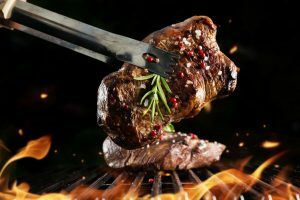 If you are preparing thicker foods, like meat and fish, you would need to create a thicker heap of charcoal to heat and prepare the food. Otherwise, it will be half cooked, and inedible. Once you are done arranging the charcoal pieces, you would need to replace the grilling grate, so that you can start preparing the food. Based on what you have planned for the meals, you would need to plan the steps. Once you are done setting up the fire, all you need to do is cook. So, bon appétit! 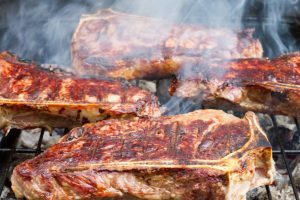 Now that you understand how easy grilling can be, there are some cautionary measures you must undertake. 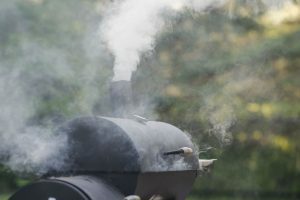 With charcoal grills, the process is different when compared to other grills. For example, charcoal grills remain hotter for a longer period. This is why you should never place any inflammable objects near the grill even when it is extinguished. You should also check for any damages in your grills before you put charcoal in it. 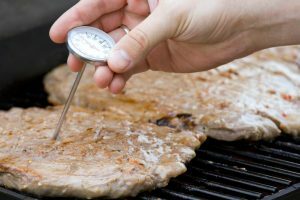 This is because if a grill has rust, there are chances that smaller charcoal pieces might fall off. Avoid using a charcoal starter fluid once you have ignited the grill fluids. This is because if you add to much starter fluid, it might become combustible, and cause accidents. In case the fire is too low, and you are having a tough time cooking, try adding some dry charcoal or some kindled twigs, instead of some fluid. This would help you to avoid accidents. Additionally, never leave the grill unattended, even after you have completed the cooking. This would actually help you to stop accidents before they happen. 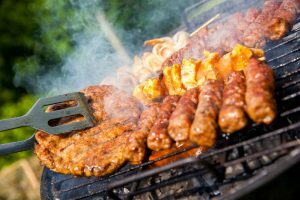 In order to avoid other problems, you should always grill outside after choosing a specific location. Also, do remember the post grilling safety measures. 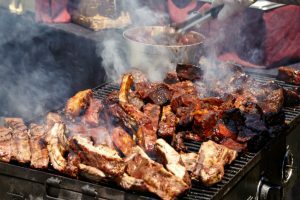 Moreover, if any kid is in the party, you should tell them about the grills and why it should be avoided. You should also keep a pair of oven mitts handy. This will help you in handling the hot equipments and make sure that you don’t burn your hand while cooking. As with everything, mistakes happen. However, if you are informed properly, you would actually be able to avoid it. If you are using charcoal grill, you would need charcoal. However, it is better to use charcoal briquettes rather than hardwood charcoal. One advantage of charcoal briquettes is that they burn longer than hardwood charcoal, making it easier for you to light the grill. 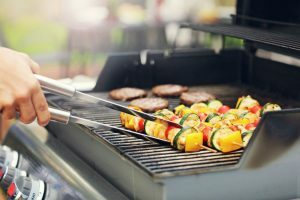 Before you start lighting your grill, make a list of what you want to cook and what you will need. For example, if you are cooking green vegetables, you would not need a high flame. 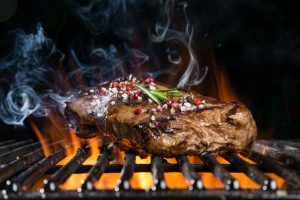 On the other hand, if you are cooking meat, you would need to use a strong flame to prepare the meat. Depending on your menu, you would need to stock up the resources and plan accordingly. Yes, it might seem easier to light the grill when you are using a lighter fluid. However, when you pour in the liquid it will leave behind a gross chemical flavor to any food you cook. Now, who will like a distinct lighter fluid flavored food among your guests? No one! So, the safest way is to use a kindler or paper for starting the fire. Knowing and following these small steps will make sure that you have a great way of cooking and enjoying outdoors. Once you have the food ready, all you would need is a table or a blanket, and you are ready to experience the nature along with your friends and family. At that stage, the only thing you need to worry about is spending quality time with your loved ones.